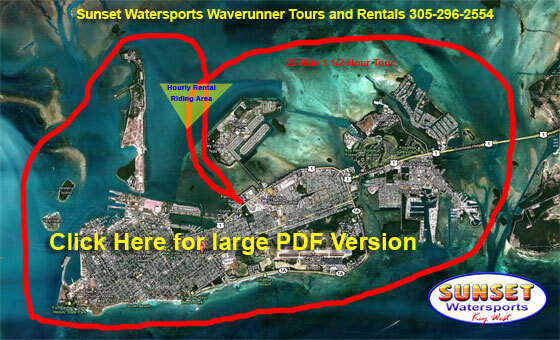 Sunset Watersports offers one of the best deals in Key West for a jet ski island tour. You can be sure you'll be riding on a state of the art machine when you rent a jet ski or take the Island Waverunner Tour with the folks at Sunset. Sunset replaces their jet ski rentals each year and they still continue to offer some of the best pricing for Key West jet ski rentals we've found. 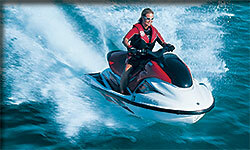 Be sure to take advantage of the on-line pricing to get the best jet ski rental deals. With Sunset you have the option to rent a jet ski by the hour or you can take one of their hour and a half long island waverunner tours. The guided waverunner tours will take you on a journey around the entire island of Key West and Stock Island, a voyage of more than twenty five miles. If you can get out of bed in time, you can save over forty dollars if you book the 10:00am tour with them. If 10:00am is little too early you can still save over $30 just by booking on-line for one of the tours. Sunset also offers a $30 discount if you reserve a jet ski rental on-line if you prefer to rent by the hour. For the hourly jet ski rentals you will ride in their large designated areas. 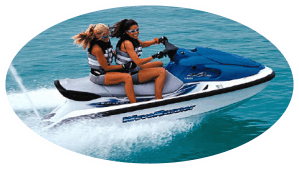 All jet ski rentals and waveruner tours originate at the Parrot Key Resort on N. Roosevelt Blvd. hour and ride in the designated area. tour around the island of Key West. Anyone under the age of 27 is required to have a Florida Boater License to ride a jet ski. The minimum age is 18 years of age. Sunset offers a Florida boaters license course for just $4. You should arrive at Sunset at least one hour before your scheduled tour. 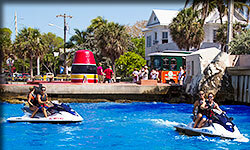 Sunset Watersports offers one of Key West's most popular attractions, the guided waverunner island tour. You'll follow a professional guide who will take you on a 25 mile informative tour around the island of Key West and the surrounding area. You will have a great time exploring the crystal clear tropical waters of the Keys and learning about the islands history. 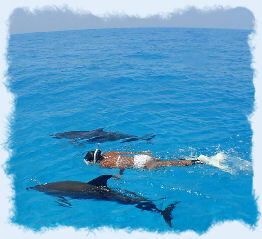 Sunset Watersports offers one of the islands best watersport attractions with it's all day do it all adventure package. The do it all watersport package includes eleven different watersport adventures for a great price. The trip includes a grilled lunch and FREE beer during the return voyage back to port. Sunset Watersport's jet ski rentals and tours are located at the Parrot Key Resort on N. Roosevelt Blvd. 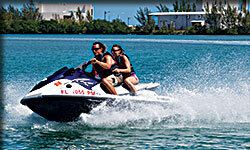 They are number one for both Key West Jet Ski Island Tours and Boat Rentals. Key West Vacation Rental Suites / Condos on the Beach! More Info / Luxury Key West Resort Condo on the Ocean!